The movie on Shiv Sena's Bal Thackeray will release today. 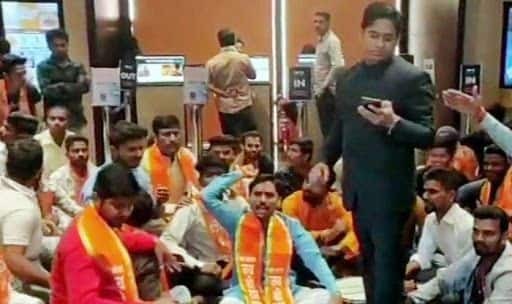 New Delhi: Shiv Sena workers created ruckus inside the premises of a movie hall in Navi Mumbai for not displaying Thackeray movie poster, news agency ANI reported on Friday. The incident took place on Thursday. The movie on Shiv Sena’s Bal Thackeray will release today. Reportedly, the workers staged a protest outside a Vashi theatre against management for not installing posters of the film inside the theatre. Meanwhile, a controversy had erupted during the screening of the movie on Thursday. A video had surfaced showing director Abhijit Panse leaving the cinema hall. Reportedly, the director was asked to sit in the theatre’s front row seat. Shiv Sena leader Sanjay Raut, persuaded Mr. Panse to stay back, but the latter refused to budge. Sources in the Maharashtra Navnirman Sena (MNS), Mr. Panse’s party, however, charged that there was no seat left for its leader to sit notwithstanding him being the flick’s director. Soon after the video surfaced, MNS workers in neighbouring Thane had erased Mr. Raut’s name from the film’s posters put up in the city in protest. Hitting out at Mr. Raut without naming him, MNS spokesperson Sandeep Deshpande had said Bal Thackeray used to treat even a common member of the Shiv Sena with love and not insult “which was also the message of the film”. “Thackeray” is a biopic of Shiv Sena founder Bal Thackeray and has Bollywood actor Nawazuddin Siddiqui essaying the late leader’s role.